CANON 1DM11N CAMERA,70-200 LENS,1.4TC, ISO 800, f22, taken from a zodiac. Active focus on the LEOPARD SEAL. A very nice sealscape, Jim. Including the ship gives a nice depth and sense of scale. I'm moving this to Wildlife. I agree with Carol's positive comments on this photo. 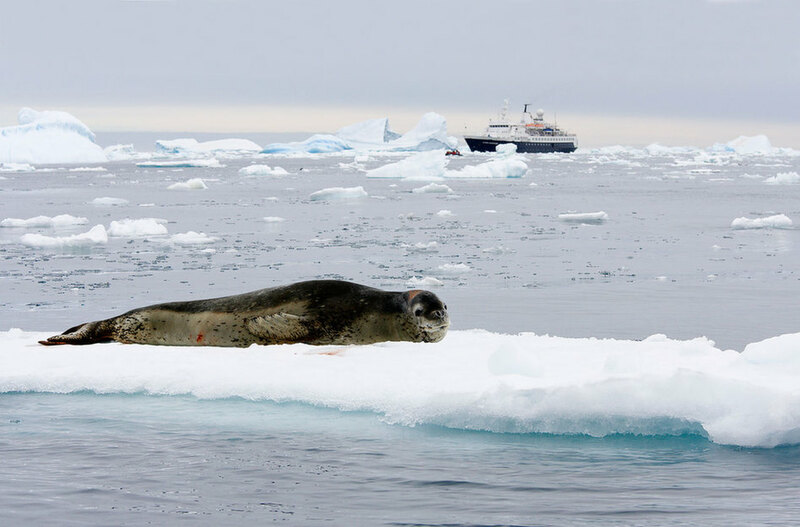 Looks like the seal has a nasty wound on his head which would explain the blood on the ice. Propeller or fighting? I like the inclusion of the ship in the composition. I think it adds some drama. It would be nice if there was context for the blood, but that may not have been possible. Glad Carol moved this to Wildlife. Superb composition Jim. Clicked large reveals much, including the flank wound, and the incoming viewers from the ship.